For with the Buddhist faith there came the germ of the belief that the Gautama Buddha in his own grandeur bore witness to One Greater — the Amitabha or Amida Buddha — that One who in boundless Light abideth, life of the Universe, without colour, without form, the Lover of man, his Protector and Refuge. He may, He must be worshipped, for in Him are all the essential attributes of Deity, and He, the Saviour of mankind, has prepared a pure land of peace for his servants, beyond the storms of life and death. This belief eventually crystallised and became a dogma in the faith of the Pure Land, known in Japan as Jodo Shinshu, a faith held by the majority of the Japanese people. It is a belief which has spread also in Eastern Siberia, many parts of China, Hawaii, and, in fact, where- ever the Japanese race has spread. And the man who stated this belief for all time was Shinran Shōnin, author of the Psalms here presented. He was born in the year A.D. 1175 near City- Royal — Kyoto, the ancient capital of Japan. He was a son of one of the noblest families, in close connection with the Imperial House, and had it not been for the passion for truth and the life of the spirit which consumed him, his history would have been that of the many other brilliant young men who sank into mere courtiers — "Dwellers above the Clouds," as the royalties and courtiers of the day were called among the people. But the clear air above the clouds in which his spirit spread its wings was not that of City-Royal, and the Way opened before him as it has opened before many a saint of the Christian Church, for while still a child he lost both his parents, and so, meditating on the impermanence of mortal life, and seeing how the fashion of this world passes away, he abandoned his title and became a monk in one of the noble monasteries whose successors still stand glorious among the pine woods above Lake Biwa. These were not only monasteries, but seats of learning, as in Europe in the Middle Ages, and here the Doctrines were subjected to brilliant analysis and logical subtleties which had almost superseded the living faith. In that cold atmosphere the spirit of Shinran Shōnin could not spread its wings, though for twenty years he gave his thoughts to its empty glitter. Therefore, at the age of twenty-nine he cast it all behind him, and in deep humility cast himself at the feet of the great Teacher Honen, who, in the shades of Higashi-yama, was setting forth the saving power of the Eternal One who abideth in the Light and in whom is no darkness — the Buddha of Boundless Light. And in this place and from this man Shinran received enlightenment. "In the spring of the third year of the era of Kennin, the age of Shinran Shōnin was twenty-nine. 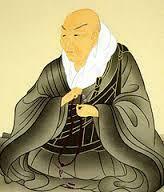 Driven by the desire for seclusion, he departed to the monastery of Yoshimizu. For as his day was so remote from the era of the Lord Buddha, and the endurance of man in the practice of religious austerity was now weakened, he would fain seek the one broad, straight way that is now made plain before us, leaving behind him the more devious and difficult roads in which he had a long time wandered. For so it was that Hōnen Shōnin, the great teacher of the Doctrine of the Land of Pure Light, had taught him plainly of the inmost heart of the Faith, raising up in him the firm foundation of that teaching. Therefore he certainly received at that time the true meaning of the Divine Promise of universal salvation, and attained into the imperishable faith by which alone the ignorant can enter into Nirvana without condition or price. "From the province of Echigo Shinran passed onward to that of Hitachi, and entered into seclusion at Inada, that little village of the region of Kasama. Very lonely was his dwelling, yet many disciples sought after him, and though the humble door of the monastery was closed against them, many nobles and lesser persons thronged into the village. So his hope of spreading abroad the Holy Teaching was fulfilled and his desire to bring joy to the people was satisfied. Thus he declared that the revelation vouchsafed to him in the Temple of Rokkaku by the Bodhisattwa of Pity was indeed made manifest." It is that revelation which speaks in these Psalms — the love, aspiration, passion for righteousness and humility which are the heart of all the great religious utterances of the world. "Alas for me, Shinran, the ignorant exile who sinks into the deeps of the great ocean of human affections, who toils to climb the high mountains of worldly prosperity, and is neither glad to be with them who return no more to illusion, nor takes delight in approaching more nearly to true enlightenment. the pity of it ! the shame of it ! " Such were the outward events of his life ; his own writings must give the history of his soul. His teachings to-day are spread far and wide in the land of his birth, and are an inspiration to millions within and without its shores. In him was the harmonised spirit of Buddhism at its highest. Those who can enter into the heart of Shinran Shōnin will have gained understanding of the heart of a mighty people which is said to be impossible of Western reading, and yet in its essentials is simple as the heart of a child. 2. Seek refuge in the True Illumination ! For the light of His Wisdom is infinite. 4. Seek refuge in That which is beyond understanding. 10. His glory shineth for ever and ever. Therefore is He called the Buddha of Everlasting Light. Most excellent is the virtue of this light, for he who perceiveth it is born into Paradise without dissolution of being. 16. Take refuge in the ocean-deep Soul Universal. For the sake of all dwelling in the Ten Regions hath He kept the fullness of all the Teachings, in His divine and mighty promises. 19. Seek refuge in the World- Honoured, for His Pivine Dower is Almighty and beyond man's measure, being made perfect in inconceivable Holiness. 24. For when a man with joy accepteth the sacred vow of Him that is infinite who saith, "I will not attain unto perfect Enlightenment unless in Me shall all the world be made whole," at that very time he shall assuredly be born into Paradise. By the divine might of His promise, by the Infinite One was Paradise created ; yea, and the Souls of men that dwell therein. And there is nought that may compare with them. Of His Land of Peace the half cannot be told. Even the word of the Buddha himself could not utter it. 29. Go forward, Valiant Souls, seeking the Law though all the worlds fall into flame and ruin, for ye shall have passed beyond birth and death ! 33. Bring homage to the Hall of Great Teaching and to the living Bo tree that is in Paradise ! Yet this land, glorious with the Holy Tree, radiant with the Hall of Great Teaching that shineth with the Seven Jewels, where innumerable souls hastening from all the ends of the Earth shall be born, is but the temporal Paradise. 35. Seek refuge in the wisdom inconceivable. For the perfection of His Virtue —that Virtue availing for all the world, and the perfect way by which He willeth that man shall take refuge in Him, are past all human speech or thought. As the pure wind blows over the trees glorious with jewels. It draweth from them a noble music with five- fold strains of harmony. 49. The Venerable Ananda, rising from his seat, and looking upwards to the World- Honoured Gautama Buddha, his eyes being opened, marvelled greatly, seeing the glory of his Lord so transfigured. Hard is it to see the hidden blossom of the myriad-century-blooming Lotus, so hard also is it for a man's understanding to receive the message of that Blessed One. 56. Teaching all that have life in the Ten Regions, that they might, with sincerity, faith, and hope, be born again into Paradise, He set forth that promise infinite and divine — the true seed of birth within the Kingdom of Truth. 67. Difficult is it for men to find a wise Teacher : so is it also for them to be instructed and to hear the Holy Law. More difficult still is it to receive the True Faith. 70. Seek refuge in the Sole Vehicle of His merciful promise. For the transitory teachings have let and hindered men in the Way of Enlightenment so that they must needs pass through the long weariness of births and deaths. 72. Binbisara, he who commanded that an ascetic should be slain before his pre-ordained time was come, by his own son was imprisoned in a seven- walled prison as the due recompense of his violence. 74. Then said Jīvaka the minister and another with him : "This act is worthy only of an outcast. For the fame of our race unworthy art thou to dwell in the Palace." And earnestly did they counsel him to change his evil purpose. 75. Laying his hand on his sword-hilt, Jīvaka, the minister, drew backwards a few steps, stead-fastly regarding the prince, that he might avert this great sin. And so it was that the prince laid down his sword, and secluded his mother in a palace. 103. Mara, the Tempter, he who is Ruler of that heaven where pleasures are collected, hath sworn unto the Lord to shield him from temptation who reciteth the Holy Name. 105. All evil spirits in heaven and earth tremble before that believer who standeth upon the Immutable promise. For even iii this world hath he the mind of Divine Illumination. 110. ''O my Lord, in the ancient time, before the Kalpas innumerable as the sands of Ganges, there was manifest in this world a Buddha, and His Name was called — The Buddha of Infinite Light. 111. "In His footsteps twelve Buddhas followed, and twelve long Kalpas have rolled away. And of these Buddhas the last was He that is called that Buddha in whose glory the Sun and Moon are even as darkness. 112. " Unto me hath that Buddha revealed the Path of the meditation of the Supreme — that meditation wherein He instructeth us that all the Buddhas of all the Ten Regions compassionate as even as a father pitieth his child. 114. "As a man encompassed by the cloud of incense casteth sweet odours about him, so he that trusteth in the Holy Promise is spiritually endued with the Divine Essence. 115. "When I was initiate in right doing, I attained unto the high way of that assurance that freed me from birth and death, through the teaching of the Noble Doctrine of the Holy Name. "Therefore in this world, rejoicing, I guide the faithful believer into the way of Purity." 120. Nagarjuna, that great priest, setting forth the two ways — the way that is straight and plain, and the way of high austerity, leadeth very gently to the Ark of the Divine Promise such as are driven through the weariness of births and deaths. 123. One Ark only, that Ark of the Divine Promise of om merciful Father, doth voyage and bear us unto the shore of the eternal peace — even us who so long have drifted hither and thither in the ocean of birth and death. 126. "Yet could we not root out our earthly desires which are the very seed of birth and death. But through that only way of the meditation of the Highest did we attain unto the final deliverance that hath destroyed all our sin." 130. When the assemblage of the believers in the holy faith is born within that Land of Purity that hath sprung from the lotus of the true enlightenment, soon shall their heart's desire be fulfilled in them. 135. The single heart perceiveth the true faith, and so doing is strong and clear as the diamond, and this strength is the wisdom of the supreme that strengtheneth us. 136. When we shall attain unto the Promised Land, which is that Nirvana past all understanding, there shall we labour abundantly for the salvation of all living things. For so the Sutra teaches us in these words : "A heart that inclineth to the succour of others." 139. A mighty King of this world brought homage unto him in his monastery and put unto him this question, saying : "If so it is that the Land of Purity should be in all the Ten Regions, how then is. it declared unto us in the Sutra that it is in the Western Heaven ?" "Of this matter can I not tell thee. It is too high for me. Still am I in the lower rank of wisdom, even still small is my knowledge. I cannot fathom this great mystery." 143. And this King of the Gi Dynasty reverently offered unto him the holy title of Shinran (Ran of Divinity) and the honourable name of "Rock of the Venerable Ran" — that his dwelling-place should be called by it. 148. He who believeth that the Sole Vehicle of the Divine Promise, most perfect, most mighty, receiveth within itself the Greatest of Sinners, and this because it is its chief will so to do, will receive the depth of this essential teaching — namely, that before the eyes of the Instructed, illusion and wisdom are in their Essence One. 151. When we shall have attained unto the faith and the deeds of the Merciful Promise through our Father that is in all things able to give them unto us, birth and death are hence- forward as Nirvana. And this is called the Gift of Departure. 153. That "Single Mind" expounded unto us by Vasubandh, the Master of Writings that excel, is nothing other than the faith of us that are now fast bound in illusion. So teacheth Donran the Great Teacher in his Commentary. 162. When the new birth through the clearness of the Divine Promise is attained in the Eternal Kingdom, it is not like unto the birth of this world ; then is there no inferiority even in those that in this world were sinners, for they have entered into Paradise. 165. And second : This faith is not Single Minded, for it hath not resolution. And third : It continueth not, for the other thoughts of the heart divide it against itself. 171. Having cast away from him all trust in the righteous deeds of the sages, Doshaku- Zenji, the Great Teacher, hath taught us to enter in at the only gate that is the Gospel of the Pure Land. 174. He who succeeded unto the teaching of Donran-Daishi, Doshaku-zenji, the Great Priest, thus declareth : "To toil and labour after righteous deeds in this life is the unavailing toil of self-effort." 176. In this world, the doing of evil and the sin that is wrought of men is violent and furious as the storm wind and rain. Therefore have the compassionate Buddhas exhorted men to seek their refuge within the Land of Purity. 177. That he might lead men into the Eternal Kingdom — those men who are in this life fast bound unto the evil thing, our Father teacheth us, saying, '' Recite my name," and hath promised further," Doing this, if they be not born again, I myself will not attain unto Wisdom." 179. Two interpreters of Zendo-Daishi were there in the age that followed his own, and these were Hosh5 and Shoko. They, it is, who have opened the Treasury of teaching that the inward purpose of the Blessed One should be wholly made known. 180. How should women turn their hearts unto wisdom — they who are fast bound with the five fetters ? No, not through the ages of myriads of Kalpas, until they seek refuge in the Divine Promise of Him who is mighty. 199. At this time when the five Signs of De- generation are manifest, many men are there who doubt and blaspheme the Holy Doctrine. Yea, even the Priests, together with the people, are enemies unto him who walketh in the right way. 201. Though the way into the Land that is in the West hath been made plain before us, yet the age-long Kalpas have rolled away without good fruit thereof 5 for we have hindered ourselves and our brethren that we might not enter therein. "In this world have I, even I, appeared as an incarnation of the Buddha, and now, my work of Salvation being accomplished, I return unto the Eternal Kingdom that is my home. 208. For he said : "Not one man is there of thousands who may not be born into the Land of Purity." And thus saying, he commendeth the followers of the Right Practice. "There is not even one among tens of thousands who may enter it." And so saying, he condemneth the doers of the mingled deed. 212. Whatsoever may be his Visible Deed that would be born into the Promised Land; he shall not forget day or night to hold fast unto the name of the Divine Promise. 214. Since the day when Hōnen Shōnin appeared in the world, and set forth the single Ark of the Divine Promise, hath the Doctrine of the Pure Land gloriously shone upon the hearts of all men in the land of Nippon. "In the glorious day of our Lord was I among the holy Assemblage on the Peak of Vultures, and my Spirit was rapt in self-instruction and in the doctrine of salvation." 235. Two thousand years and yet more are departed since the day when our Lord entered into Nirvana. Ended are the two glorious periods — the orthodox and the representative. Lament, ye disciples, who in this closing age would follow after the Lord. 243. It is a mark of the degeneration of time that man's life is brief and death cometh upon him early and with iron hands breaketh up his body and that which surrounds him wherein he dwelleth. And they who leaving justice turn to wickedness do destroy one another by their evil deeds. 250. Though we were masters of the strong will of self-effort, even should we have seen face to face the Buddhas, myriad as the sands of Ganges — they who in this world were manifested the one after the other, yet were we drifted on the torrent of birth and death, in self-effort were no rescue for us. 252. After choice that is peerless and beyond the world's understanding, after five Kalpas of musing, the Blessed One builded up the Divine Promise of the Light and Life Infinite. And this is the Essence of His Mercy showed upon us. 253. The noble mind that shall attain unto wisdom in the doctrine of the Pure Land is the mind that fain would become Buddha, and it is named : "The mind that shall save men who suffer." 256. According to the all-seeing promise of the Blessed One when the water of the faith He giveth entereth the soul, illusion passeth straight- way into wisdom through the virtue of that true land of the Divine Promise. 261. He that receiveth the true Faith, and is one with them that return no more to birth and death, shall receive the Perfected Wisdom, even as that Bodhisattva Maitreya that is called, "He that shall come." 268. It is by the strength of the Divine Promise that we can reach unto the holy name of Wisdom. Without the wisdom of the faith, how is it possible that we should attain unto the Nirvana ? 269. The Divine Light shineth over the Deep Night of ignorance, therefore sorrow not that the wisdom of your eyes is darkened. The holy Ark is at hand that voyageth over the great ocean of birth and death ; therefore fear not because your sin is heavy.
'' My disciples that shall be, they that are sinners because of the lost way and love of evil things, it is they that shall destroy my holy doctrine." 277. Well may we understand from the teaching of the myriad Buddhas in the Ten Regions — they that protect mankind — that the strong mind that seeketh enlightenment by self- effort is vain and impotent. 278. The Buddhas in the Ten Regions, innumerable as the sands of Ganges, bear witness that very few are there of men in this sinful world and decay- ing time that attain unto the true faith. 292. It is very meet that our souls rejoice exceedingly in the grace of the great compassion of the Buddha. Yea, even to the extinction of the body. And for the gracious giving of oiu: spiritual teachers we must in like manner rejoice, yea, though our very bones be broken. 294. Whoso doubteth the wisdom of the Enlightened One — that wisdom beyond all human understanding — and reciteth the Holy Name, trusting in the merit of himself, shall not rise beyond the outermost bounds of the Pure Land that is the Temporal Paradise, for he hath not the grace of right thankfulness for His Compassion. 301. Whoso doubteth of the wisdom of Him that hath Light beyond the imagining of man, and trusteth to the root of goodness and virtue — he shall not attain unto the Soul of Great Mercy, for he is born into the Outermost Places of Paradise, and slow and dull of heart is he. 305. He that is born into the outermost place, all glorious with the sevenfold jewels, shall not in five hundred years behold that three-fold jewel, the Triratna, for there is in him no spiritual well-doing, that he should give it unto his fellow-men. 309. When he perceiveth the Land of Purity, the Bodhisattva Maitreya thus questioneth the Holy One, saying, "What is the cause and what the circumstance of that man who, having been born, yet remaineth as it were straitened in the womb ? "Whoso trusteth in the root of goodness that he himself maketh to grow and hath a doubting soul, he it is that is in the outermost places of the Paradise, he it is that is said to be straitened still in the womb of ignorance." 312. Whoso doubteth the wisdom that is beyond man's understanding, and hath believed the doctrine of reward, shall of a certainty be born within Doubting Castle, and this is called conception within the womb of ignorance. 313. Whoso trusteth upon self-righteousness rather than upon the wisdom of the Enlightened One that is beyond man's knowledge, shall be conceived within the womb of ignorance, and to him shall the mercy of the Three Jewels be unknown. 316. Through the compassion of Shōtoku the great prince we, having accepted the Divine Promise sprung from the unsearchable wisdom of the Illuminated One, are made equal unto Maitreya. Bodhisattva — the Buddha that shall be — having been united unto those men who return no more to birth and death. 317. The mighty Bodhisattva of Compassion, he who is the Saviour, was made manifest in this world as Shōtoku the Prince, who, like a father, hath not forsaken us, and like a mother is ever amongst us. 318. From that past where was no beginning until the day that now is, hath Shōtoku the great prince, the Compassionate, dwelt among us like unto a father and a mother. 319. Shōtoku the Prince, from his Compassion, hath persuaded us to enter in at the Divine Promise of the wondrous wisdom of the Light-Bearer. And through this are we joined unto those men who return no more unto birth and death. 321. Shōtoku, he who is mercy's self, the Compassionate, he who is like unto a father, and the Bodhisattva of Mercy, the divine tenderness, his succour is merciful as the pity of a mother. 322. Testimony is there that Shōtoku the prince hath mercy upon us, from the myriads of Kalpas even unto this day, because the wondrous wisdom of Him who is Light beareth the load of his debt for the believer. 323. Shōtoku, the Prince, he that is in Japan called the Lord of Teaching, he whose great mercy overtops all spoken words of gratitude, must we therefore praise for evermore, having with single heart sought refuge in him. 326. The high Prince Shōtoku, he who hath guarded us and with great carefulness led us up- wards from remotest times, hath lovingly entreated us to seek our refuge in the two-fold gift of the Enlightened One. 327. Though I seek my refuge in the true faith of the Pure Land, Yet hath not mine heart been truly sincere. Deceit and untruth are in my flesh, And in my soul is no clear shining. Even my righteous deeds, being mingled with this poison, must be named the deeds of deceitful- ness. How should I cross the Ocean of Misery ? In secret serve strange gods. While bearing the appearance of the devout sons of Buddha. Yet now are they held as light as the five shameless precepts of Devadatta. 339. May they yet bring offerings with homage unto the priests, even as you do unto Saliputra or Mahamonugalyayana, those two great servants of the Lord ; though they are priests but in name and without discipline, for this is the time of degeneration and of the last days. He attained unto the supreme enlightenment, and was manifest as the Buddha of Infinite Light. 344. Into the Promised Land — the Paradise of the Great Calm. 345. The merit of His holy austerities through- out the myriads of Kalpas is fully declared in his name of Amida (the Infinite). Only he that seeketh refuge in the Eternal Father shall enter into Buddhahood as a pebble is transmuted into gold. Lacking the aid of the Divine Power, how should we attain unto the unchanging mind ? 349. In the great ocean of the Divine Promise Is there no ripple of illusion. If we enter into the ark of the Holy Vow, The spirit of mercy shall take part with our self-endeavour. 350. Since we have believed the Divine Promise, How is it possible we should be in the power of life or death ? Unchanged may be our sinful body.